It’s anybody’s guess how the present government shutdown will end, or at what cost. What is clear is that Donald Trump has met his match in a wily, tough-minded experienced adversary who, after two years of national political paralysis, finally has the tools to take Trump on. First, we might look at what we have lived through until now: minority rule, or rather, minority support for one-man rule. He was rejected by a majority of the American electorate in November 2016, receiving nearly 3 million fewer votes than his principal opponent. He hasn’t been supported by a majority of the public on many issues in polls taken before or since the 2016 election, and, when he cast the 2018 midterms as a referendum on himself, his party lost control of the House of Representatives by the widest margin of any race since 1974, the year Richard Nixon was driven from office. From Trump’s conduct in office, you’d have thought we were living in a banana republic, and a bizarre one at that. From the fact that Trump has never enjoyed a day of majority support, you’d think we were living in an autocracy. And, although there has been pushback from the media and the courts, you wouldn’t be far wrong. Legally and constitutionally, we have been functioning without majority rule for more than two years. Of course, this has happened before. It happened in 2000 when George W. Bush was chosen to be president by a U. S. Supreme Court that hijacked the election. We got a leader whose inattention cost us 9/11, who lied us into open-ended wars, and who crashed the economy. Majority rule doesn’t always produce optimal results either. But it sure beats the alternative. Too bad the Founding Fathers, patrician gentlemen all and slaveowners some, were too often more concerned with checking majorities than ensuring them. We’re a long way from getting majority rule back, two years at least even in the event of a Trump impeachment. But at least we have one of the two houses of Congress in majority hands now, and a leader with the will and capacity to challenge and maybe even thwart the infant in the White House — the nasty, surly, 239-pound infant who has tossed government institutions and constitutional restraints around like toys. Nancy Pelosi isn’t a new personality and, temperamentally, she wasn’t made to be president; her talents are legislative rather than executive, and of course her gender made it a struggle to rise in Congress itself. But it should be apparent by now that she is the most talented Democratic politician of her time, and, since few Republicans have been anything but calamitous, arguably the best one we have had over the past three decades. She did more than anyone else to rein in the last two years of the Bush presidency, and she singlehandedly rescued the Affordable Care Act when Barack Obama was about to abandon it, thus rescuing his administration from a disaster that would have made him a one-term president. The work of a legislator, though, is mostly done away from the spotlight, and so Pelosi’s career has received little general attention away from the beltway. It will get a lot more now. Republicans have been paying Pelosi the backhanded compliment of attacking her more than any other figure in the Democratic Party for the past decade. Democrats, with their almost unerring instinct for folly — remember, they nominated Hillary Clinton — made Pelosi’s vote for a second speakership a needless and embarrassing trial. Think, please, of where we would be now without her. Some have cautioned that, in personalizing the confrontation between Donald Trump and the Constitution as a contest between particular individuals — the playing field Trump likes best — Pelosi risks her own political capital, and with it that of the Trump opposition. I would judge that, at least to this point, she has gauged the problem shrewdly. You have to stand up to Donald Trump as you would to any schoolyard bully; that is, someone has to take the responsibility to say no. It can’t be a delegation, even if it represents one. Someone has to look the bully directly in the eye, and call him out. It’s not necessarily the end of the story — certainly not in this case — but it is the beginning of it. 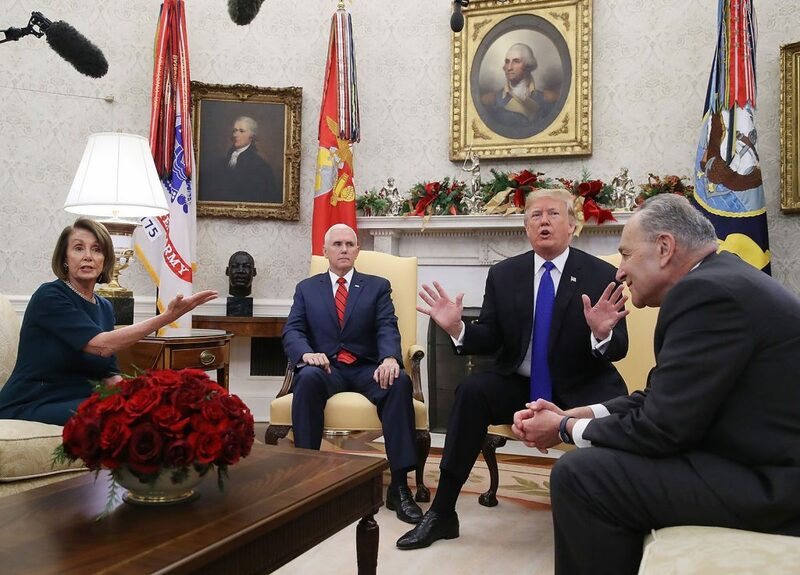 Pelosi did just this when, at a White House ambush called by Trump specifically for the purpose of denigrating her in front of TV cameras, she calmly asserted herself as the coequal head of a coordinate branch of government. The point was widely taken. Pelosi had not in fact yet been chosen speaker; she was, at that moment, simply the House Minority Leader. But her calm demeanor and assurance of election clearly disarmed Trump. Pelosi’s critical strategic challenge, however, was to refuse Trump, at least for now, his State of the Union platform in the House of Representatives: an act within her authority, as many were no doubt surprised to learn, although couched in terms of a “security” problem. In suggesting that Trump might deliver his address from the Oval Office instead, she underscored his political isolation in the shutdown crisis, and his robotic inability to function without an audience. It also created a trap into which he promptly fell by forcing her to cancel a scheduled trip to, among other places, Afghanistan, a war zone Trump has yet to visit after two years. The strategy was not without risk; Pelosi needs to personalize the resistance to Trump, but not so far as to make it appear as a standoff between two contending egos. She has been careful to appear in public with Senate Minority Leader Chuck Schumer, even to the point of awkwardly sharing a podium with him in their joint response to a nationwide Trump address earlier this month. No doubt there will be other mistakes. But thus far Pelosi has held her ground and, most vitally important, her Congressional caucus. She also holds a card she can play out over many months. It is she who would have the decisive role in initiating a presidential impeachment.